In network datacenter network topology like this, servers are connected only to Leaf ports and Spines are only used to interconnect Leafs and keep endpoint Leaf to Endpoint MAC to Endpoint IP mapping tables in order to optimize L2 and L3 forwarding. In SDN solutions for datacenter like Cisco ACI, the whole system is centrally deployed and managed using special controller cluster which pushes the configuration to each member (leaf and spine) and the system like that is then called Fabric. In Leaf and Spine topology, when servers are connected to different leaves, they always have three hops between them. First hop from server to leaf, the next through the Fabric Spines towards the destination Leaf and the third from destination Leaf to the destination server. It is the same thing is the servers are in the same L2 segment or in different ones. Having equidistant endpoints in the whole datacenter enables us to have the same latency between all servers and increases the stability and performance of network communication. On the other hand, if one Leaf or Spine fails, the bandwidth will be degraded but the communication between all vPC connected servers in the whole fabric will still be possible. Bonding more access ports from different leafs is still possible (Multi-chassis EtherChannel or vPC virtual port channel). It is done by connecting the server to two Leafs and configuring vPC in order to be able to survive Leaf malfunction. In this way, servers are redundantly connected. 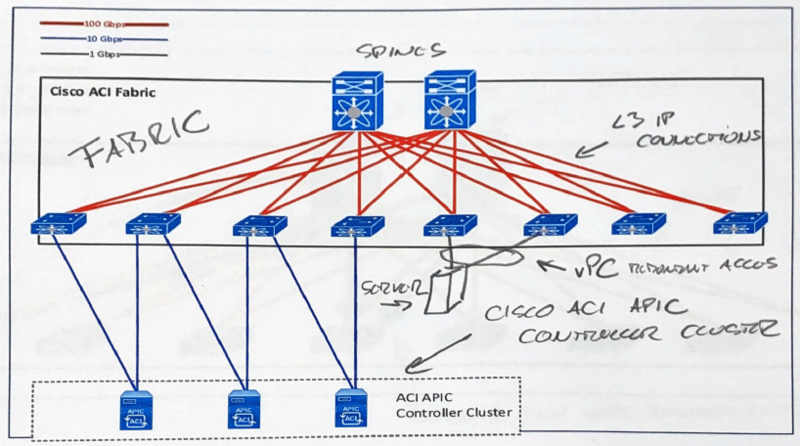 vPC peer links and similar stuff that before Leaf and Spine Fabrics meant you needed to interconnect two switches in between them in order to enable multi-chassis EtherChannel, is now resolved differently (by not connecting them together) but sending vPC peer communication and all that stuff through Spine switches. CLOS is great in scaling out (horizontal scale). All the uplinks between Leaf and Spines are always used by leveraging L3 ECMP Routing/Forwarding (Equal Cost Multipath) and even the L2 traffic which before needed Spanning Tree to fight against the loops, is now encapsulated (in VxLAN or Geneve) and Routed through the fabric leveraging ECMP and avoiding the need for Spanning tree protocol altogether (which avoids disabling redundant uplinks and using full fabric interconnect bandwidth). If servers need more bandwidth between them, CLOS Fabric make is easy to upgrade, is simply means adding more Leaf to Spine links or adding one or more Leaf and Spine devices in the fabric. In Cisco ACI case, where everything is controlled and deployed from the central controller, adding Spines and Leafs is done simply and provisioning of new devices is done automatically by registering them to fabric and waiting for the controller to provision them as part of it. Usually, Leaf to Spine links are nowadays 40G or 100G Ethernet which makes Leaf to Leaf bandwidth at 200G in the fabric. If the Leafs are more or less all 48 port 10G access port devices you get 1:2,4 ratio between downlinks and uplinks which is quite great. Next generation of Fabric will move to 400G interfabric connections making the fabric interconnect superfast.